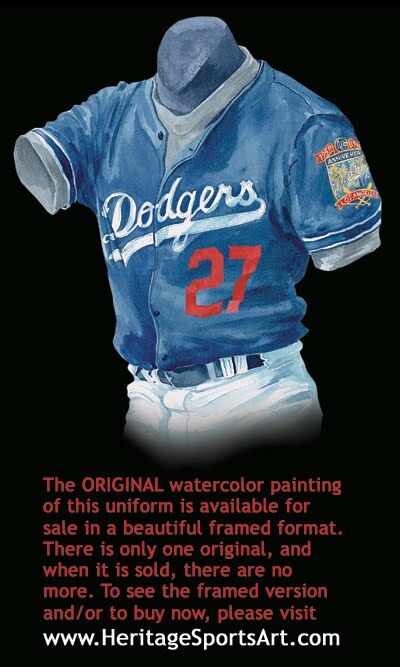 Please click on the evolution of the Dodgers uniform poster above for a close-up version of the poster. 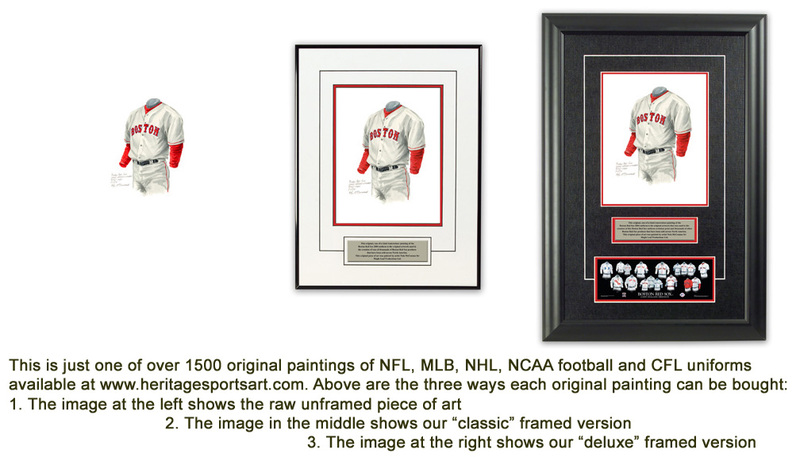 The descriptions below give you some insight and background about the uniforms and/or eras depicted in the poster. The Dodgers joined the National League in 1890, and were known as the Brooklyn Bridegrooms at the time because there were so many newlyweds on the team (7 players were said to have been married about the same time in 1888). Keep in mind that in this era team nicknames weren’t like they are today – teams were really known simply by the name of the city they represented, and team nicknames were often just that, nicknames given them by fans and writers. Often times the nickname had something to do with the team manager. That being said, in 1899 the name Bridegrooms gave way to the nickname the “Superbas”, a name sportwriters gave the team because of a popular vaudeville troupe of the same name. In 1911 to the team became known as the “Trolley Dodgers” because of the preponderance of streetcar tracks in Brooklyn – in fact most Brooklyn-ers of this time were nicknamed “trolley dodgers” because they were thought to constantly be dodging streetcars as part of their daily routine. In 1913 the name “Trolley Dodgers” was shortened to simply “Dodgers”. It should also be noted that during the 1890's the team was also unofficially known as Ward's Wonders and Foutz's Fillies – Ward and Foutz being managers of the team. Wilbert Robinson took over as team manager in 1914, and from 1914 – 1931 the team was often known as the “Robins”, but we believe throughout this period they were also officially known as both the Robins and the Dodgers. If anyone has definitive research on this subject, we’d love to read it! Please contact us at info@mapleleafproductions.com . In 1913 the Dodgers moved to magical Ebbets Field. It was considered a neighborhood ballpark, primarily because it was constructed in a residential area of town. There was a bond between the people of Brooklyn and their neighborhood ball team. Ebbets Field had arguably the most beautiful front entranceway of any ballpark in the history of baseball. For this reason it was constantly photographed. Following in the footsteps of the Chicago Cubs the year before, the Dodgers have stitched “Brooklyn” down the front of their road uniform, intersected by buttons. 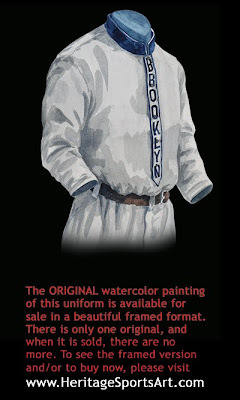 This 1910 jersey also has a blue “cadet” collar, a small upright collar worn by many teams from about 1910 to the mid-late 20’s. Notice also that there is a center belt loop, which was used to secure the belt buckle off to one side. Players of this era usually wore the belt buckle to one side so they could prevent injury when sliding into a base. 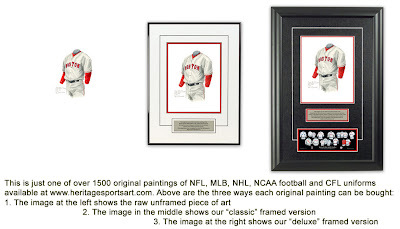 Note also that even though this jersey has buttons down the front, this is still a “pullover” style jersey that had to be pulled over the head – a practice that was common in jerseys throughout baseball at this time. We believe the first major league team to wear a completely buttoned front jersey (ie one that didn’t have to be pulled over the head) was the 1909 Phillies, followed by the 1911 Cubs. The pullover style jersey finally disappeared after the 1939 season (the A’s were the last team to wear it), but of course pullovers resurfaced in a big way with the double knit era of the 70’s and 80’s. This “plaid” style jersey was a two year experiment used on the Dodgers’ home and road uniforms in 1916, and then only on the road uniform in 1917. As we see in this 1916 road uniform, it was a cross between vertical and horizontal pin stripes. As best we can tell, the first instance of pinstriped uniforms was in 1907. 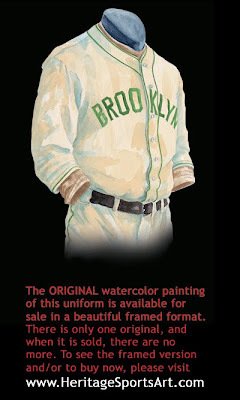 The Boston Braves road uniform were made from a gray flannel with a fine green pinstripe. Later that same year the Cubs had a new gray uniform with fine pin striping made for the World Series - they wore it for the World Series opener in Chicago and were later reprimanded by the league for not wearing a white uniform at home. The Dodgers first wore pinstripes on their 1911 road uniform. The Yankees, most often associated with pinstripe uniforms, first wore a pinstriped uniform for one year at home in 1912 (the New York Times wrote about their 1912 home opener “The Yankees presented a natty appearance in their new uniforms of white with black pin stripes”), then every year from 1915 to the present. 1916 was a year of firsts for the Dodgers – after finishing with a 94-60 record, the Dodgers (or the Robins? – see previous write up) advance to their first World Series. The Dodgers had previously won National League pennants in 1890, 1899 and 1900, but the World Series didn’t begin until 1903. Their opponent? The Boston Red Sox. The Dodgers dropped the 1st games by a single run each time, then faced a young pitching phenom Babe Ruth. The game went 14 innings, with Ruth pitching all of them, holding the Dodgers to just 6 hits and emerging with a 2-1 win. The Dodgers rebounded with a 4-3 win in game 3, but lost the 4th and 5th games 6-2 and 4-1, losing the Series in 5 games. A name to note: Casey Stengel would have worn this uniform as he led the Dodgers’ hitters in the 1916 World Series with a .364 average. Stengel broke into the majors in 1912 and played 6 seasons with the Dodgers. He later played a couple years with the New York Giants, and then went on to manage the Dodgers (1934-36), the Yankees (1949-60) and the Mets (1962-65). This road uniform was only used for one season, which is a shame. 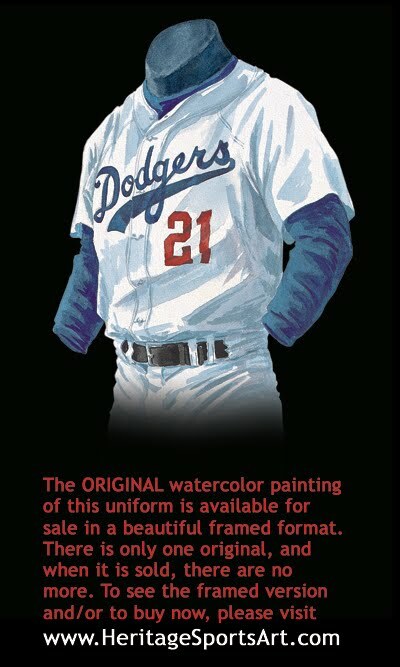 The blue “B” with red outline is unique as all previous “B”’s on Dodger uniforms were simply blue. Note also the thick double piping around the collar and down the buttoned front of the jersey. Note also the piping on the belt loops and belt tunnel – all quite unusual touches. The 1929 Dodgers finished with a 70-83 record – good for only 6th place in the 8 team National League. They were led by Babe Herman, a lifetime .324 hitter who hit .381 for the Dodgers in 1929. Herman played for the Dodgers from 1926 – 1931, then played for the Reds, Cubs, Pirates and Tigers before retiring. Then after an 8 year layoff, Herman came back from retirement in 1945 to play 37 games with the Dodgers where he hit a respectable .265 at the age of 42! 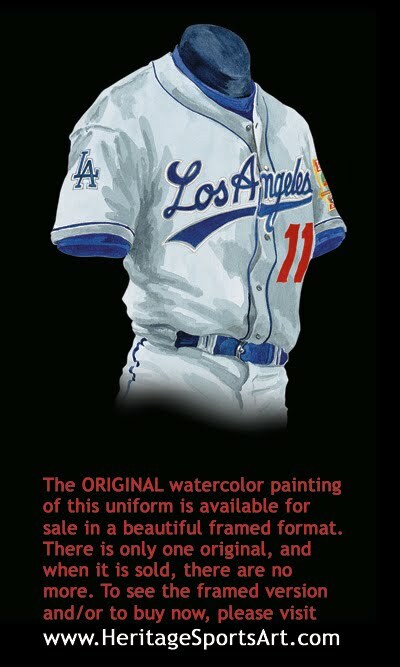 For the first time “DODGERS” appears on a Dodgers’ jersey. 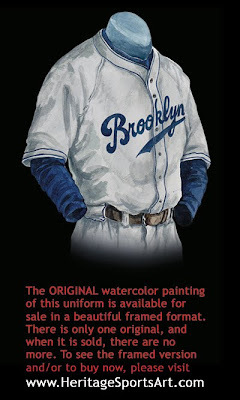 Interestingly, “Dodgers” appeared on both the home and road uniforms in 1933, then disappeared again until 1938. This may add credence to the fact that the team was known as the Brooklyn Robins from 1914 – 1931 (so named for their long time manager Wilbert Robinson). This is a beautiful pinstriped uniform with a classic “B” for Brooklyn logo on the arm. As best we can tell, the first instance of pinstriped uniforms was in 1907. 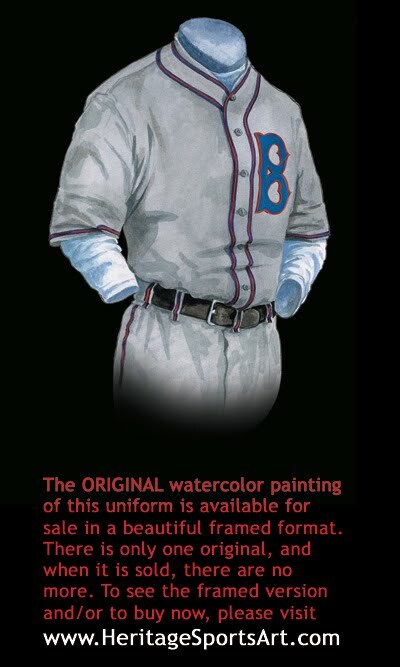 The Boston Braves road uniform were made from a gray flannel with a fine green pinstripe. Later that same year the Cubs had a new gray uniform with fine pin striping made for the World Series - they wore it for the World Series opener in Chicago and were later reprimanded by the league for not wearing a white uniform at home. 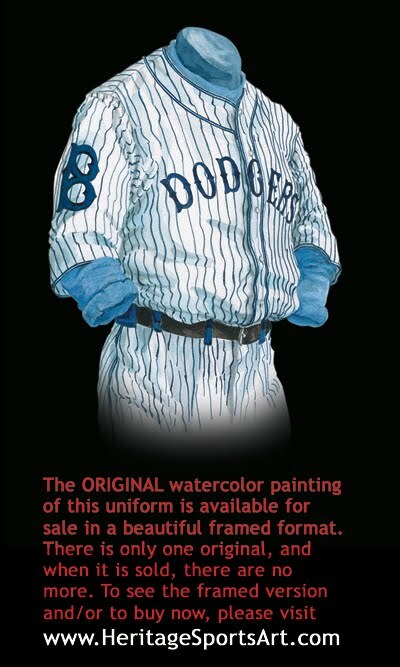 The Dodgers first wore pinstripes on their 1911 road uniform, then wore it on and off over the next 25 years. 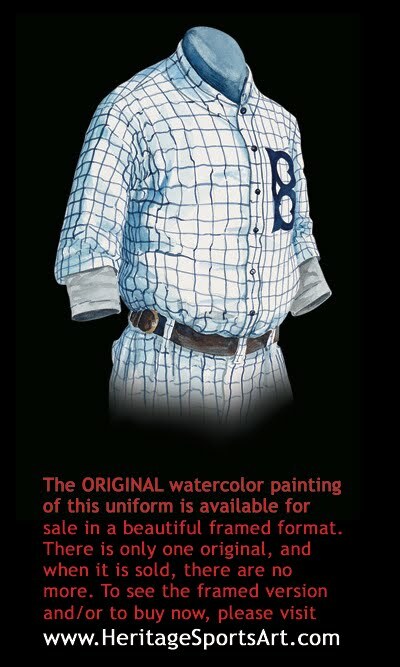 The Yankees, most often associated with pinstripe uniforms, first wore a pinstriped uniform for one year at home in 1912 (the New York Times wrote about their 1912 home opener “The Yankees presented a natty appearance in their new uniforms of white with black pin stripes”), then every year from 1915 to the present. The first All Star game is held in 1933 at Chicago’s Comiskey Park, where second baseman Tony Cuccinello becomes the first Dodger to be selected to an All-Star Game. The 1933 Dodgers finished a disappointing 65-88 under manager Max Carey, 6th place in an 8 team field – setting the stage for new manager Casey Stengel to take the reigns in 1934. The uniform went through a drastic change this season, as we see in this road uniform, “Dodger Blue” became “Dodger Green” and the traditional gray road jersey became tan. This was a bold move in uniform design, but the experiment lasted only one season. Two seasons from now, in 1939, the first televised Major League game hits the air on August 26th, 1939, as the Dodgers face the Reds. 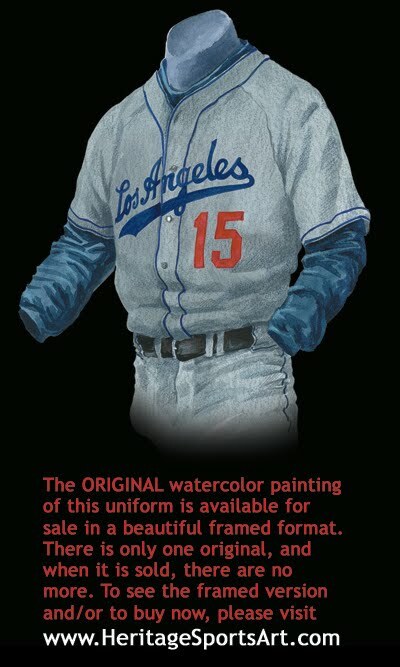 Even though it’s not pictured in this Dodgers’ poster, during the 40’s, 50’s and 60’s many teams used zippered jerseys instead of the more traditional button front jerseys, while a handful of teams wore them well into the 70’s and even the 80’s. The Reds, Yankees and A’s were the only three pre-1977 major league teams that never wore zippers. The 1937 Cubs were the first team to wear a zippered jersey, and as far we can tell the 1988 Phillies were the last to wear one. The Dodgers wore zippers on most of their uniforms from 1938 to 1946, then reverted back to the traditional buttoned front jersey. 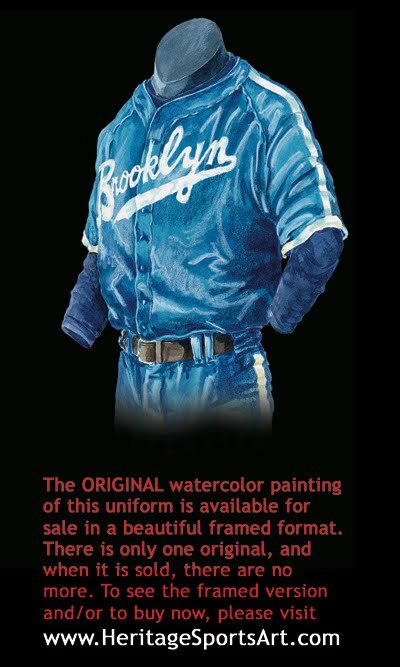 When Ebbets Field began hosting night games in 1938, Dodger management was convinced that the reflective material used in this one-year only, night game uniform, would allow fans to better see the players at night. It was made of a blue satin material. Note the “swoosh” underlining the word “Brooklyn” on this home jersey. This style was introduced to baseball by the 1932 Cubs, and has been worn by many teams since then. The Dodgers began wearing a “swoosh” on their home jerseys in 1938, and it’s been there ever since – by far the longest any team has worn an underlined name. Note also the unusual and attractive white stripe running down the shoulder to the sleeve cuff – an attractive look that we wish more teams used over the years! We believe this design element was first used by the 1938 Cubs. Wartime sleeve patches were worn by all levels of professional baseball teams between 1942 and 1945. A “Health” patch was worn during the 1942 season, part of a war-time health and fitness awareness campaign, and from 1943-1945 a “Stars and Stripes” patch was worn, as shown on the left sleeve of this jersey. 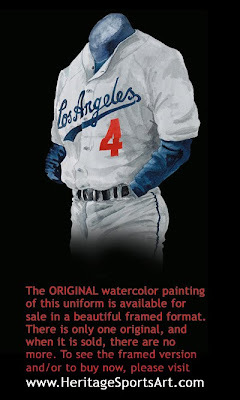 In some ways it’s hard to believe that when the Dodgers wore this jersey, Jackie Robinson was still two years away from breaking baseball’s color barrier. The 1940’s and 1950’s are also a remarkable era for baseball in New York as from 1949 – 1958 at least one of the three New York City teams makes it to the World Series. During this period the Dodgers make it to the World Series five times – 1941, 1947, 1952, 1953, 1955 and 1956 – and win it once in 1955. Let’s start with the uniform. Pictured here is a 1955 home uniform. Note that the jersey has red uniform numbers on it. Uniform numbers first made their appearance on the front of a uniform in 1952, and the Brooklyn Dodgers were the first to wear them! The Braves followed suit in 1953, and the Reds joined the trend in 1956. The 1916 Cleveland Indians actually wore a uniform number on their sleeve, but it wasn’t until the ’52 Dodgers that the number made it to the front of the jersey. You might be interested to learn the story behind the red numbers, and how they were actually supposed to be introduced on the Dodger uniforms in the 1951 World Series but then the New York Giants pulled off their famous win - "The Giants Win The Pennant! The Giants Win The Pennant!" Here is the story as told by the one and only Paul Lukas and his remarkable Uni-watch blog. Secondly, we love the simple but beautiful use of red, white and blue on this uniform – sometimes simplicity speaks louder than a rainbow of colors. Note also the lack of any piping or stripes – the design of this jersey doesn’t need any adornments to make it work. Prior to 1955, the Dodgers had been to the World Series seven times (1916, 1920, 1941, 1947, 1952, 1953) and lost each time. The 1952 and 1953 losses to the cross-town Yankees were particularly rough – the Dodgers lost in 7 games in 1952 after being up 3 games to 2 and having a 1-0 lead going into the top of the 7th inning at home; and then in 1953 they lost 4 games to 2, losing game 5 at home and then losing game 6 in the bottom of the 9th. But the 1955 Dodgers - with baseball greats Duke Snider, Pee Wee Reese, Jackie Robinson, Roy Campanella, Gil Hodges, Carl Furillo – were not to be denied. For the 8th time the Dodgers advance to the World Series, and for the 6th straight time they face the Yankees. The Yankees took games 1 & 2 at Yankee Stadium, then the Dodgers stormed back and won games 3, 4 and 5 at Ebbets Field. Game 6 goes back to Yankee Stadium, and the Yankees come out on top 5-1. Thus the stage was set for Game 7 at Yankee Stadium. October 4, 1955 – the day the Dodgers would re-write history’s wrongs. Led by Johhny Podres’ 5 hit pitching performance, the Dodgers shut down the mighty Yankees 2-0 and capture their first World Series victory. In winning the World Series, the Dodgers became the first team to win after losing the first two games. A record 17 home runs were scored in the Series, with Duke Snider hitting 4 of them, but Podres is awarded the 1st ever World Series MVP award. In a move that reminded all fans that baseball may be a game, but first and foremost it’s a business, Dodgers owner Walter O’Malley officially announced on October 8, 1957 that the Brooklyn Dodgers were moving to Los Angeles, a move that had been announced prior to the 1957 season but wasn’t believed by fans who hoped against hope that it was all a bad dream. It many ways it’s hard to believe the fact that the Dodgers would even contemplate moving – the Dodgers were among the best teams in baseball for the last 10 straight years, and they played in one of the all time classic ballparks, one that is revered to this day. Yet the realities were that Dodger attendance had been falling off throughout the 50’s, and Mr. O’Malley had been publicly calling for a new ballpark for several years but his cries fell on deaf ears. And there was one other reality – there was a huge market on the west coast that was prime and ready for the picking – if Mr. O’Malley didn’t move, one of the other owners would have beaten him to the punch. Thus it was that the Brooklyn Dodgers and the New York Giants both moved to the wets coast for the 1958 season. After a poor season in 1958 (they finished in 7th place with a 71-83 record), the Dodgers found themselves right back in the World Series, only this time as the Los Angeles Dodgers and this time against the Chicago White Sox. After losing the first game by a lopsided score of 11-0, the Dodgers came back to win the Series in six games for their 2nd World Series victory in nine trips). Dodger relief pitcher Larry Sherry emerged as the hero of the series, pitching in relief in all four Dodger victories – winning two, saving two and fashioning a 0.71 ERA in 12 2/3rds innings. He received MVP honors for the Series. This 1959 road uniform sported the words “Los Angeles”, just as it did for the first time in 1958. 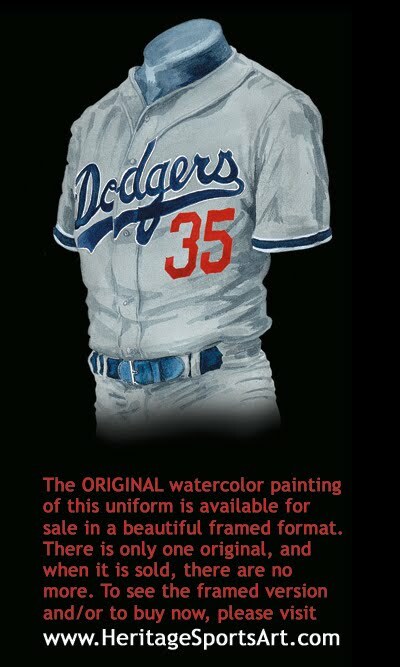 But interestingly, the Dodgers didn’t re-design their uniforms, they kept to the exact same design guidelines, virtually ignoring the fact that the team had moved 3000 miles west. The only difference between this road uniform and the 1959 road uniform pictured earlier is the fact that the thin blue piping around the collar and down the front has been removed, simplifying the design even more. After beating the Yankees in 4 straight games to win the 1963 World Series, the Dodgers finished first in the NL with a 97-65 record and found themselves back in the World Series for the 7th time in 14 years (1952, 1953, 1955, 1956, 1959, 1963, 1965). This time the Dodgers face the surprising Minnesota Twins, a team which like the Dodgers left their long time home (Washington) for greener pastures further west (Minnesota). Los Angeles defeats Minnesota 4 games to 3 to win the World Series yet again. In the IN a tremendous see-saw battle, the Twins win games 1 & 2 – stunning Dodgers’ pitching greats Drysdale and Koufax. Then the Dodgers stormed back to win 3 straight, holding the Twins to just 2 runs in three games. Then the Twins rebounded to win game 6, setting the stage for some drama from Sandy Koufax . Pitching on only 2 days rest, Koufax throws a complete game 3 hitter and the Dodgers beat the Twins 2-0 in Minneapolis. Koufax is duly honored with the World Series MVP award for the second time, the first being two years earlier in 1963. This two-time World Series MVP is a feat achieved by only one other player since the World Series began awarding an MVP, namely Bob Gibson in 1964 & 1967. Remarkably, Koufax would pitch one more year (he finished the 1966 season 27-9 with a 1.73 ERA) before retiring at 31. As you can see on this home uniform there is little change in the uniform design since 1955 (indeed since 1952 when the Dodgers added uniform numbers to the front of their jersey). This home jersey is unusual for what it isn’t – it isn’t a double-knit style that most major league teams succumbed to during the 70’s and early 80’s. In the 70’s and 80’s, almost every other team in baseball adopted a pullover style, made of stretchy, synthetic material. The pants worn by most teams were called “Sans-a-Belt”’s because the elasticized waistline eliminated the need for a belt. 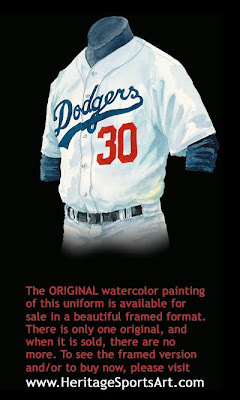 But the Dodgers and the Yankees were the only two teams not to go to the button-less double knit style jersey with sans-a-belt pants for either their home or road uniform. The Orioles almost can be included with LA and New York, but O’s had a double knit orange uniform that they wore from time to time during this period. So it’s interesting that the Dodgers met the Yankees in the 1977 World Series. Final score? Yankees 4 games, Dodgers 2. And as if that weren’t enough, the same players met in the 1978 World Series with the same result. Damn Yankees. Enough said. Aha! A small change! 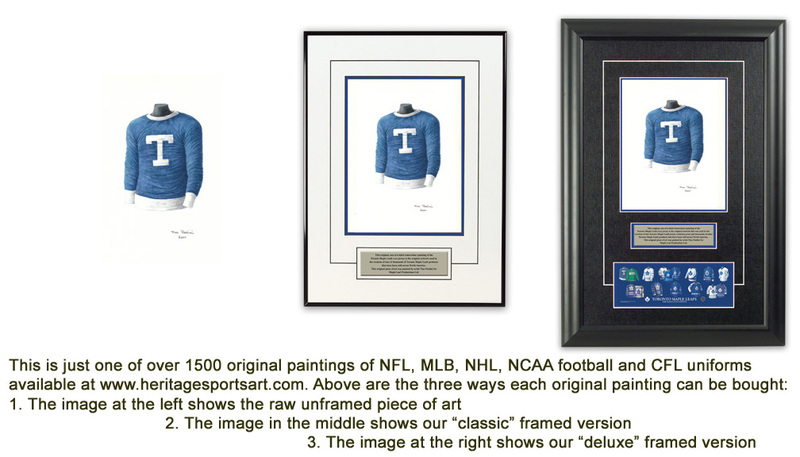 If you look closely, you’ll see at least two changes in this road jersey vs the 1965 and 1959 versions shown earlier. 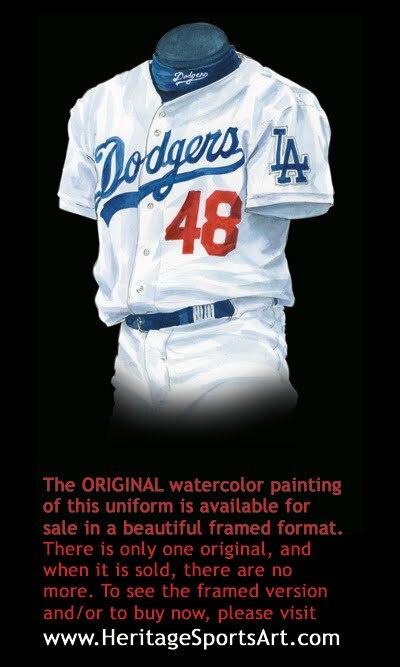 Please note the striping around the sleeve cuff, and also the thin white border around the “Dodgers” lettering on the front of the jersey. After winning it all in 1981 against the Yankees, the Dodgers make it back to the postseason in ’83, and ’85, only to fall short of making it to the World Series. Not so in 1988! After a tough 7 game series against the Mets to win the NL Pennant, the Dodgers went on to face the Oakland A’s in the World Series. Game 1 was voted the greatest moment in Los Angeles sports history. With the Dodgers down 4-3, with 2 out in the bottom of the 9th, a severely injured Kirk Gibson limps to the plate to pinch-hit. He swings with everything he has, and launches a game-winning two-run homer over the fence. This would be Gibson’s only at-bat in the Series. This was a moment that will live in baseball lore forever, and images of a limping and lurching Gibson rounding the bases will be shown on highlight reels ling after most of us have left this mortal coil. After game one, Dodger pitching dominated the series won by the Dodgers in 5 games. The A’s hitters struggled to figure out the Dodger pitchers, and finished with a meek batting average of .177 (even in their win the A’s could only manage 5 hits against LA’s 8). Series MVP Orel Hershiser won two games, including 17 strikeouts, and only gave up 2 runs in the deciding game 5. Hershiser also won the Cy Young Award this season as well as breaking Don Drysdale's 1968 record of 58.2 consecutive scoreless innings, with 59. The Dodgers actually wore a slight variation of the patch worn by all other teams in the majors. The Dodgers’ “Jackie Robinson” patch acknowledges the fact that it was the Dodgers’ franchise with which Robinson broke into the majors, thus there is an added banner on top of the Dodgers’ Jackie Robinson 50 patch that simply says “Dodgers”. After this season is over Dodger President Peter O'Malley announced that after owning the team for over 50 years, the O’Malley family was putting the Dodgers up for sale. On March 19, 1998 the FOX Group took over the Dodgers from the O'Malley family, and a new era in Dodger history begins. 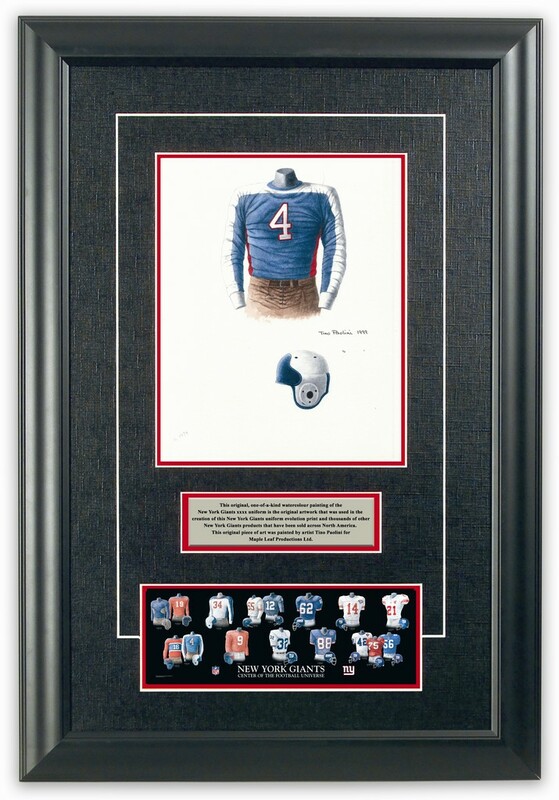 Once again, compare this 1997 home jersey with the 1977 and 1955 home jerseys shown in this poster – they are all virtually identical – a remarkable testimony to the beauty of classic design. This is the first time since 1944 that the Dodgers have worn a blue jersey. This jersey is what is referred to nowadays as a “3rd jersey”. A 3rd jersey is a concept that became commonplace by the mid 90’s. Most 3rd jerseys are worn occasionally at home as well as on the road, giving a team a third option as to what uniform to wear. And of course, the addition of a third jersey adds to the options fans can buy, thereby increasing apparel revenues and ultimately benefiting the team. More recently, teams have begun adding 4th and even 5th jerseys to their roster of uniform possibilities. The patch on the left sleeve of this 1998 jersey commemorates the 40th anniversary of the Dodgers moving to Los Angeles. Notice the addition of the “L.A.” monogram on the right sleeve of this 1999 road jersey. If you could see the left sleeve, you would also see a patch that the 1999 Dodgers wore to honor great players from the past. In fact, the 1999 Dodgers wore 18 different “Heroes” patches throughout the season - each one honoring a different Dodger hero. The 18 players honored were: Roy Campanella, Ron Cey, Don Drysdale, Steve Garvey, Kirk Gibson, Gil Hodges, Sandy Koufax, Tommy Lasorda, Manny Mota, Don Newcombe, Pee Wee Reese, Jackie Robinson, Bill Russell, Mike Scioscia, Duke Snider, Don Sutton and Maury Wills. Note also that the Dodgers have reverted back to wearing the more traditional “Los Angeles” on the front of the road jersey as opposed to wearing the team nickname on the road. The basic rule of thumb in baseball has been for teams to wear the team nickname on their home jersey, and their city name on their road uniform. In 2003 Dodgers closer Eric Gagne was as close to a sure bet as you can get in baseball as he went a stunning 55 for 55 in save opportunities. He had a hot start in 2004 and his save streak continued another 29 games before he finally blew a 2-run 9th inning lead against the Arizona Diamondbacks on July 5th. But Gagne had rung up a remarkable and perhaps unmatchable 84 straight saves over nearly a two-year period. July proved to be an important month for the 2004 Dodgers as the won 21 of 28 games and took over the lead in the National League West division. It would be a lead they would not relinquish as they battled the Giants and the surging San Diego Padres down the stretch. The season came down to back-to-back weekend series with the Giants. On the next to last week of the season the Dodgers went into San Francisco and took 2 out of 3 and went into the final week holding their own destiny as the Giants needed to sweep the Dodgers in LA just to force a playoff. The Dodgers lost the opening game of the series, but came back to win the next game after Steve Finley smacked a grand slam in a 9th inning rally to give the Dodgers a 7-3 victory and the NL West title. The Dodgers finished the season with a 93-69 record, two games ahead of the Giants. They would go on to meet the St. Louis Cardinals in the NLDS, but this where Dodger luck would run out. The best-of-five series opened in St. Louis and the Cardinals took advantage of their home field, winning Games 1 & 2 by identical 8-3 scores, leaving the Dodgers with their backs to the wall heading back to LA. The Dodgers would rally in game 3 at Dodgers Stadium as Jose Lima threw a 5-hit shutout leading his team to a 4-0 victory. But the Cards were not to be denied this year and they closed out the NLDS with a 6-2 victory in Game 4 in LA. 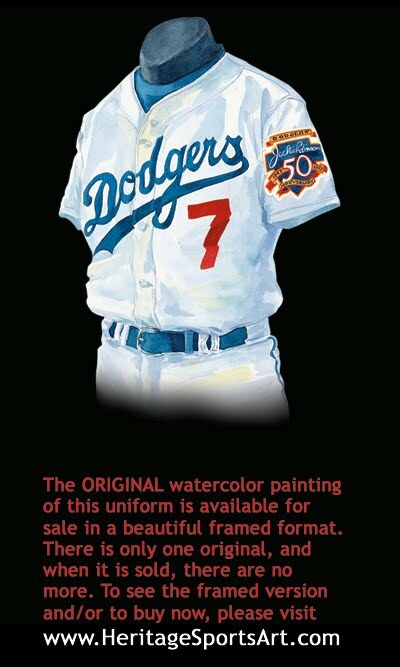 When the Dodgers were eliminated in Game 4 at Dodger Stadium they were wearing this classic white home uniform. This is the same look the team has had since their hey-days in the 1940’s and 50’s when they were based in Brooklyn, NY. Please note that this jersey has an interlocking LA logo on the left sleeve. Scott, thanks for the great history of the Dodgers uniforms through the years. I see you captured where the team added the white border in 1988 but when did it go away to what we see today?